The 1850s was a decade of continual conflict and turmoil in the United States. Sectionalism, the loyalty to your own part of the country, was rampant and added to the tensions building to the war. There were three sections predominant in the United States, the North (New England and the industrialized Ohio Valley), the South (the farming and slavery dominated Southeast and Texas), and the West. Missouri was somewhat at a level of confusion and frustration. Its central location placed the State in ways as part of all three sections. The Mason-Dixon survey line separating the North and the South ran across Missouri’s southern boundary, making it a part of the North. Many of the inhabitants of the State migrated from Southern states, such as Tennessee and Virginia, with their slaves, making Missouri a slave state with strong attachments with the South. Plus, being to the west of the Mississippi River gave the State its association with the West. Since there was not a clear-cut position for the State in concerns to sectionalism, there tended to be many struggles to establish its place in the nation. Missouri’s long-time senator, Thomas Hart Benton, although a Democrat, had connections with former President Martin Van Buren. Van Buren was instrumental in the growing “Free Soil” movement, a political party focused on keeping slavery out of new territories. This association between the two angered many Missourians and hurt Benton’s influence. Just like when Missouri became a state, the people saw slavery as an individual’s right in the same view as owning a farm or business. They saw slaves strictly as property and felt the Free Soilers were tampering with property rights. Even though Benton worked against the Free Soil mission, some Missourians saw him as too much Washington and not enough Missourian. This is all going to play a role in journey to the end of Benton’s “control” of Missouri politics. 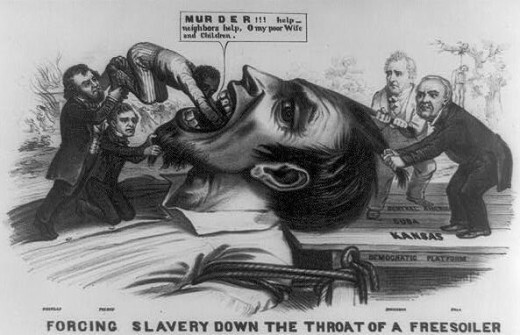 Missouri Democrats would attach themselves even fuller with the pro-South/pro-slavery efforts of the State. Benton’s fellow senator, David Rice Atchison, was deeply ingrained in this position. Atchison would even lead pro-South militia during the Civil War. Missouri would also support the Mexican War veteran and avid pro-slavery advocate, Sterling Price, as governor of the State. The Kansas-Nebraska Act of 1854 brought a significant end to the practices of the Missouri Compromise. This law split the Kansas Territory in two, as the states of Nebraska and Kansas. Both states would enter as Free states when they arrived. Missourians were concerned about the emphasis on restricting slaveowners from entering the West. Missourians felt that they would have the ability to influence Kansas in whether it became a free or slave state, while Iowa felt the same about Nebraska. Missourians did not want to see Kansas become a Free state. They were afraid that if blacks were allowed to exist as free in Kansas it would cause slaves in Missouri to escape and find their way to Kansas. Many Missourians would travel into Kansas and attack those against slavery. Towns and people were lost and the term “Bleeding Kansas” would become synonymous with the struggles and armed conflict waged during these years. The Missourians who crossed into Kansas were called “Border Ruffians.” Some of the people from Kansas retaliated, attacking Missourians and destroying their property. These Kansans were called “Jayhawkers” and there was death and injury felt by both sides. Violence ensued with the holiday season of 1855. Atchison led Missourians into Kansas three different times and worked to assist the proslavery residents of Kansas. In May 1856, they raided the headquarters of the Free State party in Lawrence Kansas, destroying two newspapers, a hotel, and several homes. That same week, abolitionist, John Brown killed five proslavery settlers in retaliation to the Lawrence affair. Known as the “Pottawatomie Massacre,” this brought national attention to the radical Brown. Lawrence would be the site of a later tragedy that would incite hostilities between the two areas even more. The 1857 Supreme Court case of Dred Scott v. Sanford impacted Missouri and brought a national interpretation on influence over slavery that would last for decades. Scott had been a slave of an army doctor, John Emerson, in the 1830s. Emerson was stationed in St. Louis at Jefferson Barracks, with Dred Scott serving as his house servant. Emerson would be transferred to a new location in the Wisconsin Territory, a free territory. Scott was maintained as Emerson’s man servant and would marry a female slave bought by Emerson during this time. They all would return to Missouri and this led to Scott thinking he could seek freedom since he had been in a free territory. 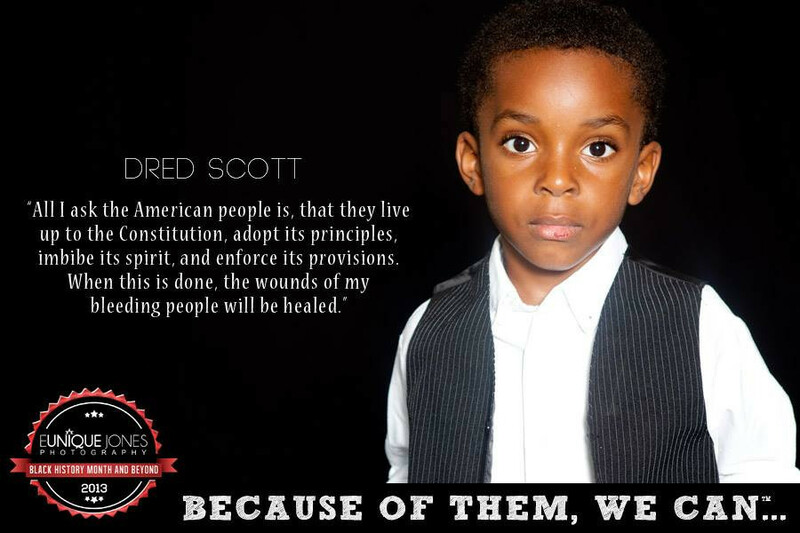 Scott went to court in Missouri in an attempt to gain his freedom. At one point, the St. Louis Circuit court ruled in favor of Scott, but the Missouri Supreme Court would reverse the decision later. Eventually Scott and his lawyers would find their efforts for freedom before the United States Supreme Court. Scott hoped that the Court would overturn the Missouri decisions. Unfortunately for him, Chief Justice Roger Taney had other ideas. The United States Supreme Court of 1856 contained seven justices appointed by pro-slavery presidents from the South. Five of that group was from families with slaves. One could assume that such influences must have played into the decision made by the court. 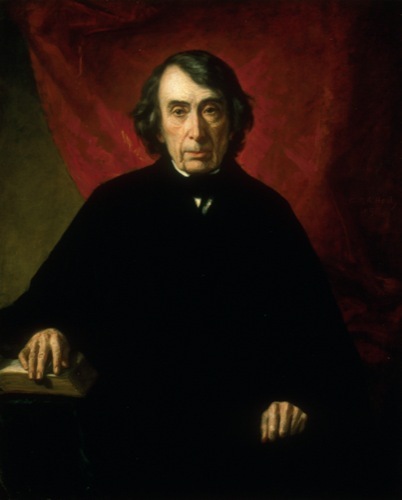 Taney in his decision for the Court claims that since Scott is black, he could not be a citizen and hence had no right to use the federal courts, Congress has no right to legislate slavery in the territories, and so forth, this case is not valid. Taney’s words establish the American position for the next several decades on situations with African Americans. It has been considered by many as one of the worst decisions ever made by the Supreme Court.